More and more private stakeholders are using eye-catching lighting to stand out in the public realm. To what extent, and how, can cities better coordinate private lighting in the public space? The accessibility of LED technology and its multiple potentials for colours and dynamism have led to its widespread use. With more and more multi-coloured, brightly-lit buildings, advertising screens, media facades and projections, private property owners, businesses and advertisers are increasingly using light to enhance their visibility in the urban space. While this may complement existing public lighting levels or create a certain ambience in a particular street or area, it can also be invasive and contribute to light clutter. Excessive or badly designed private lighting can distract passers-by, creating issues for safety, or intrude in homes where it may disrupt sleeping patterns. It can have a negative impact on cities where people live, work and play. Inappropriate private lighting initiatives can also negatively affect a well-crafted lightscape such as, for example, in cultural heritage areas. “Light has become accessible to anyone“. This is particularly problematic in cases where cities have invested in beautiful lighting for the enhancement of world-renowned heritage sites, creating special ambiences not only for tourists but also for the various uses of the city by night. 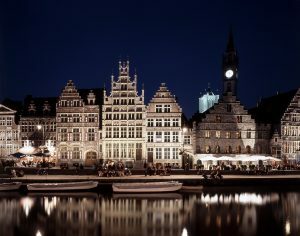 “The City of Ghent has created a beautiful nightscape over the last 20 years through the implementation of our Light Plan. Functional streetlighting, atmospher ic and monumental illumination all work together to create a well-balanced nighttime atmosphere. But because of the rise of private and commercial lighting with dynamic LEDs and billboards in the public space, this balance is in danger,” explains Bart Peeters, Light Plan Manager in the Belgian city of Ghent. This is a topic of concern for several cities today, and it raises many questions, especially in relation to governance of public lighting: what is the vision and the strategy of lighting in the city? Who does what? Who is in charge? What are the regulations to follow – if any? And perhaps, the most basic question of all: who has the right to light? Who has the right to light? This exploration of private lighting in the public realm has been an area of study for Jean-Michel Deleuil, Professor at INSA (the National Institute of Applied Sciences – Lyon) for some time now. “Public light and private light are the two sources of production of the city’s night landscape, and therefore, also its image and its identity. Yet they do not work the same way. Public lighting is controlled by a political authority; private lighting is a result of the social and economic activity of the city. Neither of them can do without the other, but it is very difficult to coordinate them both,” he explains. T. Marsick feels that better coordination and stricter regulations are called for. “Today in Lyon, there is no overall governance framework that public authorities can refer to in order to regulate the use of private lights. There is a regulatory framework that focuses on only the schedule of switching lights on or off, but in no way does it address the quality of light. In fact, today, a permit is required to restore a building, but not for its lighting. And yet, in both cases, we are talking about the quality of the urban landscape,” he says. “As this is a common problem faced by many cities, I think we should think about new regulations together,” adds B. Peeters. 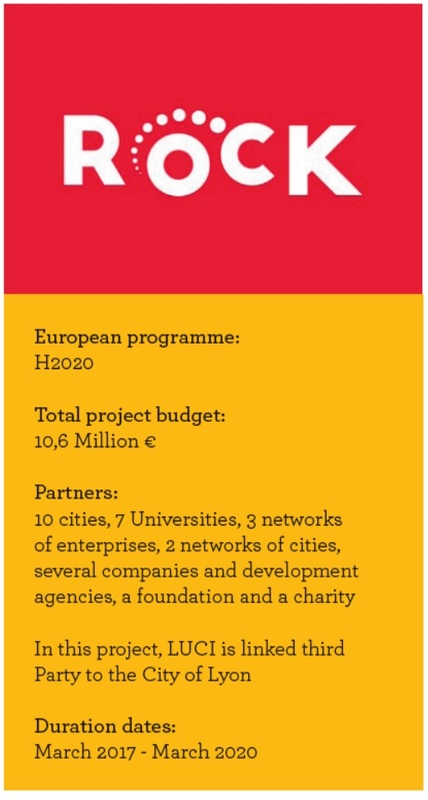 This is one of the issues addressed in the ROCK EU project, a H2020 funded project driven by the City of Bologna (Italy). The project aims to explore how cultural heritage can be an asset in a creative city. Amongst the project’s many activities, a few city partners plan to take a closer look at the fundamental role that light plays. Specifically, they will study the impact of private lighting on a city’s nightscape and how cities can create better urban lighting governance structures that take this topic into account. Students from INSA have already begun working on this issue in both Lyon and Ghent. Their aim is to develop a typology of public and private lighting and to study impacts on the nighttime atmosphere. 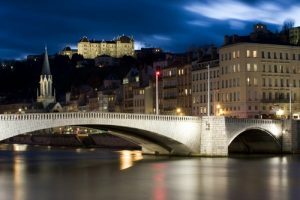 They will analyse light clutter in the nightscape of three areas in Lyon’s historic city centre and interview local retailers, lighting professionals and trade associations. In Ghent, the Light Plan will be studied with a closer look at existing rules, regulations and practices on coordinating private lighting. This work will feed into a database of private lights (classified according to their origins – commerce, transport, activities, housing, etc.) and public policies that frame private lighting. “These tools should eventually allow us to compare cities, their policies and their nocturnal landscapes and help decision-makers establish the most appropriate measures for their own situation,” says J.M. Deleuil. The issue will be studied further on a European level within the framework of ROCK. The project team, led by the City of Lyon and supported by LUCI, has conducted a survey to explore existing regulations and practices on this topic in European cities. “The idea is to collect information about policy and practice regarding private lighting within the public realm. The central issue we expect to see arising is about governance of public light and private light particularly in historic areas and prevention of light clutter,” says Mark Burton-Page, LUCI General Director. 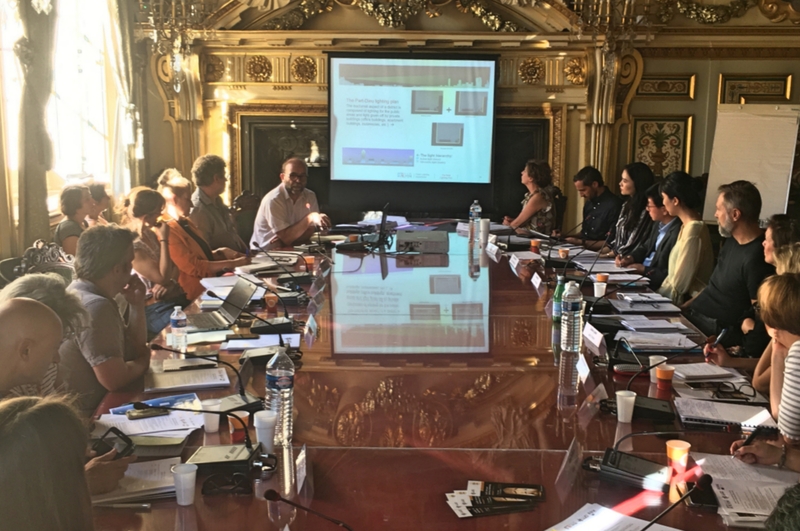 The City of Lyon and LUCI co-organised a workshop to share and build collective intelligence on the topic in September 2018 at Lyon. Nine cities – Bologna, Geneva, Ghent, Gothenburg, Glasgow, Liverpool, Lyon, Seoul and Vilnius – participated in the workshop and shared experience on how governance of private lighting can have an impact on regeneration and optimisation of cultural heritage cities.